In recent years, the number of jellyfish “blooms” (large groups of jellyfish congregating in a relatively small area) appears to be increasing, and these blooms impact both local marine ecosystems and human life as well. This is clear by the many news stories jellyfish blooms have featured in lately, including killing thousands of farmed salmon, increasing sting concerns for beach-goers, and jellyfish-induced damage to nuclear power plants and desalination plants. While blooms are often a normal part of being a jellyfish, and are thought to have occurred naturally for millions of years, it’s becoming clearer that climate change and other factors are positively affecting many jellyfish species around the world, likely resulting in an increase in jellyfish blooms. The list of suspects responsible for the apparent increase in blooms includes climate change, overfishing, increasing nutrient levels in waters, and increasing amounts of artificial structures in marine areas. 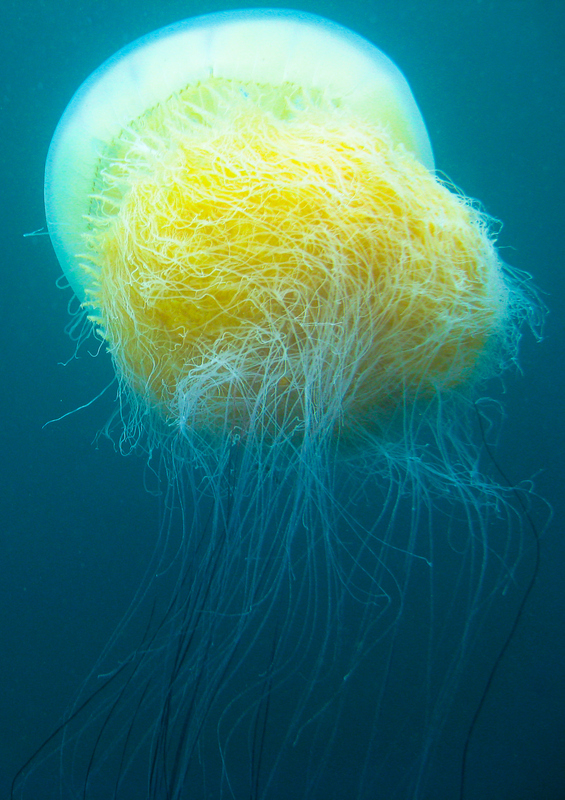 Overfishing can eliminate predators and competition, while higher nutrient levels in the water (due to farm fertilizer run-off) can increase the numbers of prey for the jellyfish and kill more competitors. Marine structures provide more areas for the polyp stage of the jellyfish to thrive in. Jellyfish additionally have been hitching rides on ships to areas where they didn’t previously live and can flourish in the absence of natural predators. Aside from their blooms, jellyfish have also made the news recently due to being sent into space and then not doing so well after returning to Earth and being studied to make energy-efficient robots since jellyfish move using less energy than any other animal. So it’s good to keep in mind that even if you don’t live near jellyfish-infested waters, increases in jellyfish blooms can still affect your daily life (such as by decreasing the supply, and increasing cost, of salmon), and there are likely things you can do to help solve this growing problem (such as by decreasing your energy consumption).